ABluePikmin for pointing out how to enable feeding on creatures as a werewolf in the vanilla game. Have you ever wanted to make your beast form just a little bit stronger, or to make it viable to play over 50 level on master difficulty? Do you want to be able to switch between different amounts of boosts or settings (like non-hostile NPCs, unlimited beast form duration, looting ability, etc.) without exiting the game? Have you ever feel that some features of a mod don't suit your playstyle, but you were unable to turn them off? Then this mod is for you. 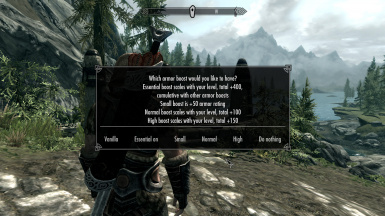 This mod allows you to customize every aspect of your beast form as you see fit. 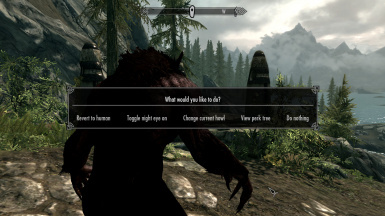 Also, it features its own standalone werewolf perk tree (for both Dawnguard and non-Dawnguard versions), revert power, toggle-able night vision and ability to switch between howls in beast form. Also, added two features - "save your current race" (if you changed your race through showracemenu, you will be transformed to your new race instead of original one) and auto reequip spells, power and any one or two handed weapon in your right hand, including staffs, bows and crossbows. Important note: make sure you install correct version - Dawnguard or non-Dawnguard. 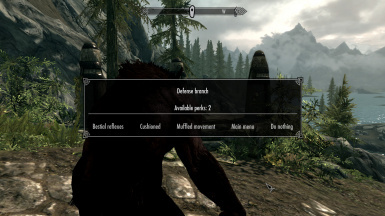 You should put this mod lower in load order (lower than Dawnguard or any other werewolf mod), otherwise you may not have access to some of its features. 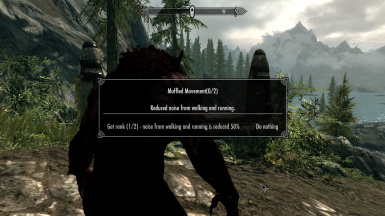 Also, you must exit werewolf form before installing this mod. You can adjust werewolf boosts and transformation settings by forging customization ring (if you have the beast blood), equipping it and using "Z" button to activate customization power (power equips and unequips with the ring. By the way, you don't need the ring to be equipped all the time - you can safely unequip it or even remove it from your inventory after finishing customization). You can choose armor, magic resistance, claws damage, health and stamina values and health regeneration rate boosts from the three different types - small, normal and high, or even set them to vanilla values. Normal and high boosts scale with your level (except heal rate) like in vanilla game. Note: All of these boosts are cumulative with any other mod changes. 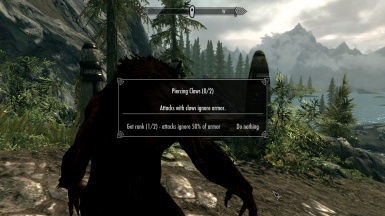 For example, if other mod increases werewolf armor rating by 50 points, and you choose small (+50) armor boost, then you'll have +100 armor rating in beast form. There is also toggle-able essential armor boost (total +400 armor rating, scales with level) available in non-Dawnguard version, which is cumulative with other armor boosts. For more information about boosts see images section. You can enable looting, looting and opening your inventory or disable these things for more immersion. You don't want people to attack you in beast form? Then just change the appropriate setting for your taste. You can choose the time you spent in werewolf form to be 2,5 minutes (vanilla), 5 minutes (medium), 10 minutes (long) or even unlimited. Will your enemies be feared when they see you transforming into a werewolf? Daedra, dragons and undead won't be feared. Options will become available when you reach the appropriate level (15 for low levels and so on). Will you be healed during transformation into a werewolf? Now you can even adjust cooldown for Beast form power! Note: this cooldown will be shown in your "Active magic effects" section, so it will be easier to see when the power is ready to use. No cooldown - power can be used at any time. Will wolves attack you in human form or will they see you as a pack member? Usually werewolves have weakness to silver weapons. Will you have it too? Would you like to gain bonuses from sleeping or not? The revert form ability from my other mod lets you to transform back to human at any time. Note: usually it takes a few seconds before changing you back, so don't worry if the transformation didn't start right after choosing "revert to human" option. You can toggle night eye on and off. If you choose to revert while using night eye, it will be automatically unequipped. By using this option, you can switch between vanilla howls. This mod has its own standalone perk tree, which does not conflict with any other perk tree from Dawnguard or vanilla Skyrim. 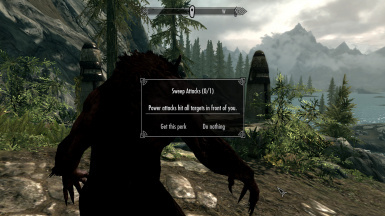 Note for Dawnguard users: you still have to get all the perks (even those added by other mods) from Dawnguard werewolf perk tree to be able to get new ones from this mod. For more information about it see images and "Werewolf perks" sections. You can now feed on animals in beast form in vanilla Skyrim. This was done to make it easier to get new perks. Rank 1. Power attacks hit all targets in front of you. Rank 2. Attacks with claws hit all targets in front of you. Rank 1. Attacks with claws ignore 25% of armor. Rank 2. Attacks with claws ignore 50% of armor. Rank 3. Attacks with claws ignore 75% of armor. Rank 1. 20% chance to slow time during an enemy's power attack. Rank 2. 30% chance to slow time during an enemy's power attack. Rank 3. 40% chance to slow time during an enemy's power attack. Rank 4. 50% chance to slow time during an enemy's power attack. Rank 5. 50% chance to slow time during an enemy's power attack in werewolf form and 10% chance in human form. Rank 1. -25% damage from falling. Rank 2. Half damage from falling. Rank 1. Noise from walking and running is reduced 50%. Rank 2. Walking and running does not affect detection. First of all, choose correct version - Dawnguard or non-Dawnguard. If there is a PlayerWerewolfChangeScript.pex in your Scripts folder, then remove it from this folder. Put two files (esp and bsa) to your Data folder, and check esp file in the Skyrim launcher. You should put this mod lower in the load order (lower than Dawnguard, or any other werewolf mod), otherwise it won't work properly (see compatibility section for more information). 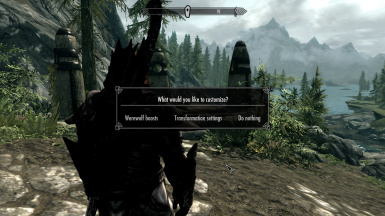 Also, you must exit werewolf form before installing this mod. 1. Exit beast form and wait until the beast form cooldown wears off. 3. Go to your powers section and equip "Restore default settings" power. 4. Press "activate power" button and wait until a notification shows up (or just wait a few seconds). 5. Unequip the ring, remove it from your inventory (for example, put it in a barrel) and fast travel to another location. 6. 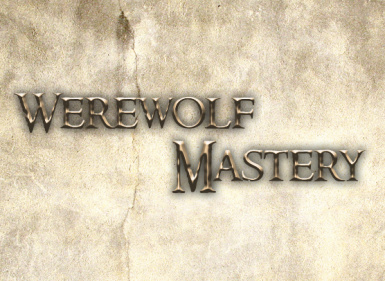 Delete WerewolfMastery.esp and WerewolfMastery.bsa from your Data folder. So it is compatible with Tales of Lycantropy and any Dawnguard werewolf perk tree mod. Mods that change PlayerWerewolfChangeScript.pex and DLC1WerewolfFeedPointsScript.pex. If you have mods that have any of these files changed, and you put them lower than my mod in your load order, then some parts of this mod won't work. And don't tell me its not working and need a fix before checking this. If there is a PlayerWerewolfChangeScript.pex in your Scripts folder, then this mod won't work properly. To fix this, simply remove this script from the Scripts folder. By the way, if other mod changes AbWerewolf to increase heal rate, then choosing a heal rate boost will greatly increase it. None (they were fixed while testing). Q: Is this mod compatible with "modname"? A: See compatibility section of the description page. Q: Will you add an MCM option? A: Yes, but only when I'll have time to learn more about SKSE. Q: I'm using Dawnguard version and there is always the same "Feedings to get next perk: 26" in this mod's werewolf perk tree menu. A: You need to get all the perks from vanilla Dawnguard werewolf perk tree (even those added by other mods) before you can get ones from this mod. where X is the value of dlc1werewolfmaxperks. Q: Do I need to have the ring equipped all the time? A: No, you can unequip it or even remove it from your inventory after finishing customization. Q: I have Dawnguard version and I can't feed on animals and loot, pick locks, etc. A: You need Savage feeding perk from Dawnguard werewolf perk tree to be able to do it. Q: Vigilants and Dawnguard are attacking me, why this happens? A: If you set "Hostile wolves" to "non-hostile", you'll be added to the wolf and werewolf faction, which is an enemy faction to the Vigilants one, so they'll attack you on sight. Turning this option off before meeting Vigilants will prevent this to occur (you can turn it on again when you'll get far enough from them). Q: I can't access the werewolf menu/I can't open inventory in werewolf form/NPCs are still hostile in werewolf form/beast form duration isn't unlimited, though I've installed the correct version and I can forge the ring and access configuration menu. A: You have another mod that overwrites PlayerWerewolfChangeScript.pex. Put my mod lower in load order (or remove this script from your Scripts folder) to gain access to these features. Q: I can't forge the ring/The ring has no effect when I equip it and use "activate power" button. A: You should have Beast Blood (not just Beast Form power) to be able to forge and to use it. 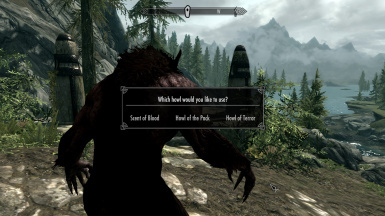 Beast Blood is gained after completing Companion's Silver Hand quest or by using a mod that turns you into a werewolf. 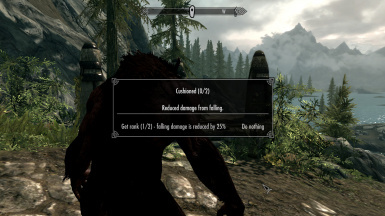 If you want to have only the revert ability, then take a look at my Werewolf Revert Form mod. At the moment the v3.0 update is only available for Dawnguard version. I'm working on the non-Dawnguard update now. First of all, the mod was remade from scratch, so you'll have to uninstall the previous version before updating. Don't forget to follow Uninstallation guide. - Two new perks: 2nd rank of Sweep attacks and 3rd rank of Piercing claws. 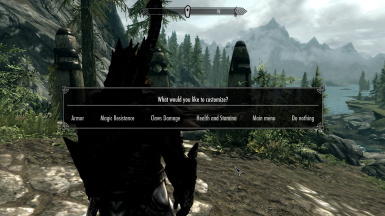 - The mod now re-equips your spells, power and any weapon in your right hand (i.e. any one or two handed weapon, staffs, bows and crossbows). - New optional "Feed then loot" file that removes the "feed or loot" dialog by automatically choosing the "feed" option. After that the body can be looted. Note: there is only an esp in that file, so it requires the main file to be installed first. Then just overwrite the esp. - "Finish customization quest" was renamed to "Restore default values". - The ring now gives powers to customize beast form and restore values only if the player is in human form. - "Restore default values" power can now be used by a non-werewolf. - The mod no more modifies AbWerewolf. - Bestial reflexes menu no longer gives option to get the first rank if player already mastered that perk. - Small boosts now actually work. - Normal magic resistance boost now has proper values. - All the dirty edits are now removed from the mod (including the one that caused conflicts with Dawnguard werewolf perk tree mods). Added six new customizable settings and reworked Beast Form duration setting. Now you can see all the changes you made - added "(Current)" word to all the settings and boosts that shows which option is active at the moment. Perk tree option now available even if you didn't use the ring yet (so it will be available all the time). 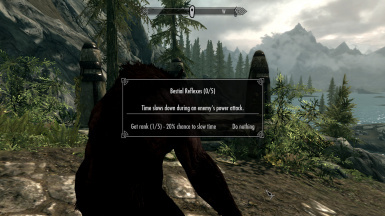 Fixed in Dawnguard version: first rank of Cushioned perk from this mod's werewolf perk tree now properly gives 25% damage reduction instead of 50% (it used to give second rank instead of the first one). v1.1Fixed small bug in Dawnguard version that allowed player to get more than 12 werewolf perks from this mod (vanilla Dawnguard werewolf perks aren't affected).